Victor Harbor is a town in South Australia on the south coast of the Fleurieu Peninsula, about 80 km south of the centre of Adelaide. 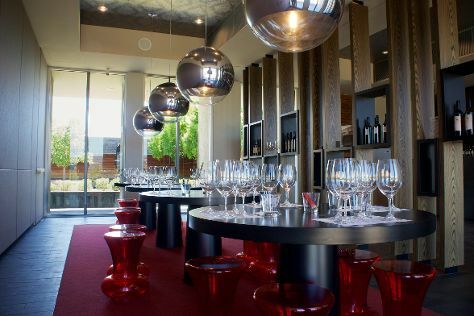 Get out of town with these interesting Victor Harbor side-trips: McLaren Vale (Primo Estate, Producers of McLaren Vale, & more) and Willunga (White Feather Red Winery, Willunga Leadlight and Glass Studio, & more). The adventure continues: step off the mainland to explore Granite Island, don't miss a visit to Victor Harbor Heritage Trail, pause for some serene contemplation at St Joan of Arc Catholic Church, and get engrossed in the history at Encounter Coast Discovery Centre. For more things to do, ratings, other places to visit, and tourist information, use the Victor Harbor trip planner . New Delhi, India to Victor Harbor is an approximately 19-hour flight. The time zone difference when traveling from New Delhi to Victor Harbor is 4 hours. Prepare for cooler weather when traveling from New Delhi in June: high temperatures in Victor Harbor hover around 18°C and lows are around 8°C. Finish your sightseeing early on the 8th (Sat) to allow enough time to travel to Kangaroo Island. Spend the 9th (Sun) exploring nature at Flinders Chase National Park. 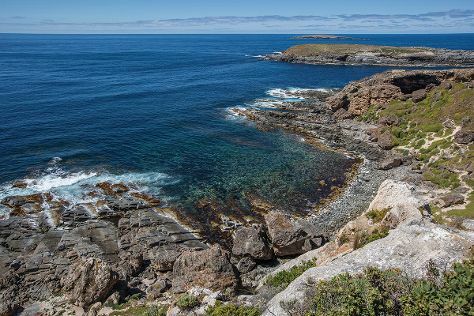 And it doesn't end there: identify plant and animal life at Seal Bay Conservation Park, enjoy breathtaking views from Cape du Couedic Lighthouse, take in the dramatic natural features at Admirals Arch, and wander the wide-open spaces of Island Pure Sheep Dairy. To see reviews, photos, ratings, and more tourist information, read Kangaroo Island journey builder tool . Traveling by combination of car and ferry from Victor Harbor to Kangaroo Island takes 2.5 hours. Alternatively, you can do a combination of bus and ferry. Finish your sightseeing early on the 11th (Tue) so you can travel to Port Lincoln. Start off your visit on the 12th (Wed): have unforgettable encounters with a shark diving experience. Here are some ideas for day two: cruise along Winter Hill Lookout, examine the collection at Axel Stenross Maritime Museum, stop by Boston Bay Wines, then make a trip to The Old Mill, and finally go for a walk through Parnkalla Walking Trail. For maps, photos, ratings, and other tourist information, read our Port Lincoln tour itinerary planner . Getting from Kangaroo Island to Port Lincoln by flight takes about 3 hours. Other options: do a combination of car and ferry; or do a combination of taxi, ferry, and bus. 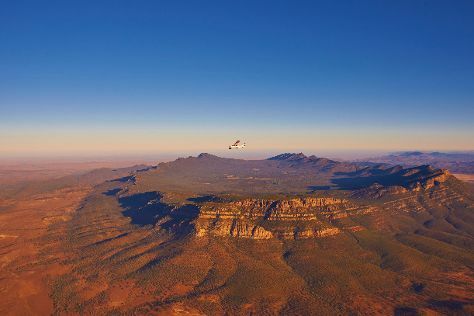 Wrap up your sightseeing on the 13th (Thu) early enough to travel to Flinders Ranges National Park. On the 14th (Fri), explore the striking landscape at Wilpena Pound, admire all the interesting features of Heritage Blinman Mine, and then explore the different monuments and memorials at Kanyaka Ruins & Cemetery. On the 15th (Sat), you'll have a packed day of sightseeing: stroll through Brachina Gorge Geological Trail and then take in the dramatic natural features at Bunyeroo Gorge. For other places to visit, photos, and more tourist information, read Flinders Ranges National Park trip planning app . Traveling by car from Port Lincoln to Flinders Ranges National Park takes 6.5 hours. Alternatively, you can fly. June in Flinders Ranges National Park sees daily highs of 19°C and lows of 7°C at night. Finish up your sightseeing early on the 15th (Sat) so you can travel to Hawker. Hawker is a town in the Flinders Ranges area of South Australia, 365km north of Adelaide. Kick off your visit on the 16th (Sun): explore the striking landscape of Flinders Ranges National Park. Get ready for a full day of sightseeing on the next day: take some stellar pictures from Wangara Lookout, then explore the fascinating underground world of Yourambulla Caves, then browse the exhibits of Jeff Morgan Gallery, and finally explore the world behind art at Wilpena Panorama. To see ratings, more things to do, maps, and more tourist information, go to the Hawker trip itinerary planning site . Getting from Flinders Ranges National Park to Hawker by car takes about 1.5 hours. Cap off your sightseeing on the 17th (Mon) early enough to travel to Coober Pedy. Coober Pedy is known for museums, historic sites, nature, wildlife, and shopping. Your plan includes some of its best attractions: admire the landmark architecture of Faye's Underground Home, take in the architecture and atmosphere at Serbian Orthodox Church, examine the collection at Old Timers Mine, and stop by Seven Stones Designer Jewellers. Start your trip to Coober Pedy by creating a personalized itinerary on Inspirock. The Route module can help you plan travel from Hawker to Coober Pedy. In June, plan for daily highs up to 20°C, and evening lows to 9°C. Cap off your sightseeing on the 20th (Thu) early enough to travel to Mount Gambier. Explore Mount Gambier's surroundings by going to Coonawarra (Balnaves of Coonawarra, Parker Coonawarra Estate, & more), Naracoorte Caves National Park (in Naracoorte) and Penola (Mary MacKillop Interpretive Centre & Petticoat Lane). Next up on the itinerary: explore the activities along The Blue Lake, explore the striking landscape at Umpherston Sinkhole, browse the collection at Mount Gambier Public Library, and admire the natural beauty at Cave Gardens. To see photos, traveler tips, maps, and other tourist information, go to the Mount Gambier trip planner . Getting from Coober Pedy to Mount Gambier by flight takes about 5 hours. Other options: drive; or take a bus. Traveling from Coober Pedy in June, expect nights in Mount Gambier to be about the same, around 7°C, while days are slightly colder, around 15°C. Finish up your sightseeing early on the 23rd (Sun) so you can travel to Adelaide. Step out of Adelaide with an excursion to The Cedars in Hahndorf--about 30 minutes away. Dedicate the 25th (Tue) to wine at some of the top wineries in the area. There's much more to do: contemplate the long history of Adelaide Oval, hunt for treasures at Adelaide Central Market, admire the masterpieces at Art Gallery of South Australia, and meet the residents at Adelaide Zoo. To find traveler tips, more things to do, photos, and tourist information, read Adelaide trip itinerary builder tool . You can fly from Mount Gambier to Adelaide in 3 hours. Other options are to drive; or take a bus. June in Adelaide sees daily highs of 18°C and lows of 8°C at night. You will have some time to spend on the 29th (Sat) before leaving for home.